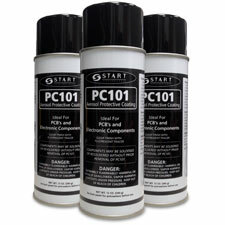 START International® PC101™ 12 oz. Aerosol Spray is a single-Component, fast-drying, easily-repairable coating for printed circuit boards and electrical equipment. PC101™ is a clear compound of specially polymerized resins that protects circuit boards and electronic components from the atmosphere. It dries tack-free at room temperature within ten minutes of application and cures to a tough, flexible covering. PC101 ™ has widespread acceptance in the electronics industry, is used by many major production companies and corporations, and was developed to meet mil spec MIL-I-46058C. Heat resistance: No change when heated to 400°F (204°C) and allowed to return to room temperature. No ill effects. Color unchanged.